NATO flags flutter during the final day of NATO Saber Strike exercises in Orzysz, Poland, June 16, 2017. 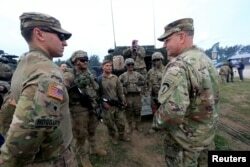 U.S. Army Europe commander Ben Hodges speaks to soldiers during the final day of NATO Saber Strike exercises in Orzysz, Poland, June 16, 2017. FILE - Russian servicemen equip an Iskander tactical missile system in Kubinka, outside Moscow, Russia, June 17, 2015.